Working harder isnt always enough when you need to outperform your competition or meet tight deadlines. Thats why the RICOH Aficio MP C2550 is so groundbreaking. This incredibly versatile system makes it affordable to add attention-grabbing color. Plus with the optional internal finisher, you can create finished documents without sacrificing floor space. 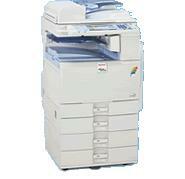 No matter what document tasks you handle, the Ricoh Aficio MP C2550 is the smart choice. For powerful print performance, these systems offer the innovative, icon-driven Ricoh Refined Print Command Stream (RPCS) driver, as well as PCL5c/6, XPS and optional genuine Adobe PostScript3 drivers.